It's coming up to a year now since we made the shift as a family to a fully vegan diet. It seemed like a good time to reflect on the whole experience and what things have gone smoothly and what challenges we have faced. A few friends have recently been moving towards this way of living and that has given me the push to finally get some things written down. There are many reasons why more and more people are choosing a vegan lifestyle and depending on which category you fit into there are different approaches to a smooth transition. 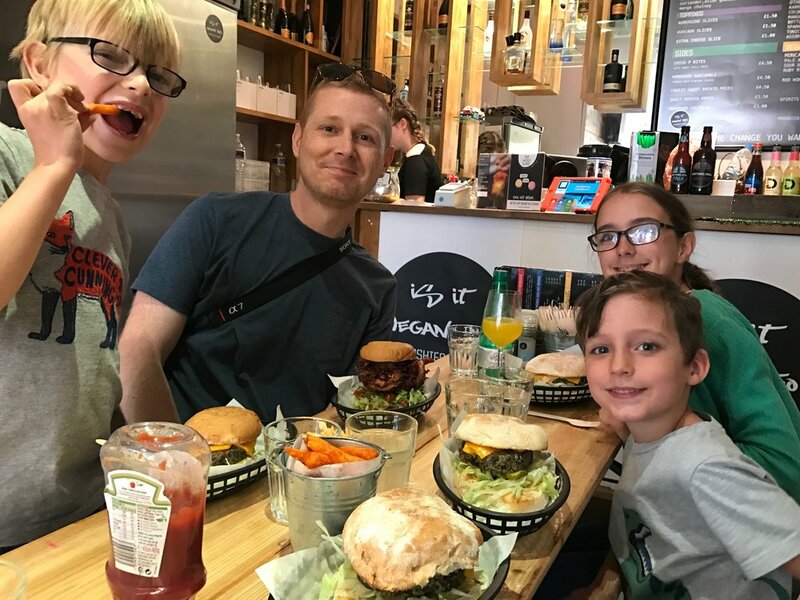 I had been vegetarian for 20 years for ethical reasons and then subsequently gave up dairy whilst breastfeeding for my son's health but quickly realised I felt health benefits myself. A couple of years later having done lots of research on the subject (and watched some incredible documentaries) I made the full switch to being vegan for both ethical and health reasons. Once I realised that this was a lifestyle which was also so crucial supporting the environment it felt like a no brainer to me. Arguably this is a fairly 'small steps' approach, first vegetarian, then dairy free vegetarian then finally vegan over the space of many years. Despite being fully vegan myself I have never been purist about the movement and fully support any move towards anyone eating/using less animal products. If giving up meat one day a week is all you and your family can do at the moment, that is ok and a good step in the right direction. Like any lifestyle change, it is something that is always easier with support from family and friends. I have been very lucky to have had mostly positive support from the people around me and people had trusted that I would be well researched and make the right decisions for my family. Along this journey we have made sure that we have talked to the kids honestly about our reasons for making changes. I don't believe in scaring them with gruesome slaughterhouse images but gentle explanations of what goes on behinds the scenes in the dairy and egg industry helps them to feel a part of something important. Kids are really committed when they understand the why. They understand that we have ethical motivations but we also always emphasised that we believe this to be the best way for them to build strong healthy bodies. There is no talk of good and bad food in our house, just eating what nature gives us to grow well. We have a rule at home that the kids can help themselves to food at anytime as long as its fruit, veg or nuts. Anything else they have to check with us first. That way the fruit bowl is their first go to source when they're hungry and its always kept topped up. The kids wellbeing and health will always be my top priority and I fully believe that I am giving them the very best start in life. I also believe that this way of living will help them to grow into kind compassionate human beings who realise we have a part to play in the welfare of other living things and our planet. We generally try to eat with the kids as much as possible and get them involved with the cooking and prep. They will always try new foods that are offered but of course there are some things they don't like just like any kids. My daughter took a long time to find a milk alternative that she liked on cereal so I bought lots of different types over a few weeks for her to try and she finally found she loves cashew milk. Often if they are not sure about certain things I just keep cooking them again and again until they finally decide they're nice : ) Having a varied diet is key to expanding tastebuds from this young age and exploring a whole range of flavours. I have found it somewhat curious how many people ask me questions about my children's nutritional status once they find out we are fully vegan. Never before have people been so concerned about their protein and vit B12 levels! Some are genuinely interested and want to learn more from our experiences. Others, I feel are trying to find flaws in our approach but I do understand that this is human nature and something you learn to deal with when you make decisions against the grain. I make sure that I am as well read and educated as can be in the subject and always answer questions as honestly as possible. The kids take a daily vegan multivitamin (we use this one) and a vegan Omega 3 oil. They may well get all their requirements from their diet but I figure there's no harm in making sure we're covered. The children school meal provider have been awesome in issuing a separate vegan menu and separate again vegan and gluten free menu for Noah. After a few teething problems with the school chefs they are easily able to eat at school when they choose to do so. They mostly take packed lunches as I'm happier that they are getting the healthiest option that way but it's good to have the choice. Kids parties and playdates have also always been an area that people assume will be tricky. Generally the best advice is always just to be polite, open and honest. I will make sure the other parent knows that the kids are vegan then always offer to provide them with their own food if its at all problematic. More often than not people are super accommodating. On the odd occasion that things can't be altered I've found our what the other kids are having and sent mine with a similar vegan version. Having a whole bunch of vegan snacks in my bag most of the time tends to avoid there being any sense of 'missing out'. I will say that preparation is key, I think especially for us as it can be really tricky to find places to by a quick snack that will meet both the vegan and gluten free criteria. This leads me on to my next point which is travel. We love to visit new places both in the UK and abroad but are always aware that our diet isn't necessarily the easiest to cater for! Generally if we can we'll pack a picnic or at least some sandwiches just in case, and we always check ahead if we plan to eat out. There are so many amazing restaurants now that cater well for differing needs and luckily the kids like a wide variety of foods. Asian and Indian restaurants are very often our first choice for good options. Having been caught out abroad a few times with hungry kids and no idea where to eat we always do our research beforehand now. A cold tiring two hours in Berlin at 9 o'clock at night springs to mind before we found the one open takeaway that sold chips and heated up beans from the local convenience store! There are so many online forums and sites with great information and tips its pretty easy to find options. So defintely plan ahead, it may not be the most spontaneous way to travel but saves a lot of stress! Initially the change to veganism was a primarily a dietary one. I gave up buying or wearing leather or suede when I turned vegetarian but hadn't given too much thought to other products I was using on a daily basis. As I became more aware of veganism as a whole lifestyle approach I realised that I was no longer happy being in 'blissful ignorance' about the products I used. I researched a lot online and have transitioned all my toiletries and make up items to fully vegan versions that are not tested on animals. Marks and Spencer's own make up range is surprisingly good and very ethically sound, and Holland and Barrett is a good inexpensive place to pick up vegan toiletries. Locally here in Brighton we are fortunate enough to have Infinity Foods which stocks a wide range of, well pretty much anything you could want! We also only buy organic eco friendly cleaning items and no products contain honey. I now also make sure that I only buy vegan wine or beer and luckily many pubs near us now label this clearly. Barnivore is a great online source but don't be afraid to talk to your local wine shop. For us, Plumpton wines happen to be local, delicious and vegan. Win, win, win. Large supermarkets are also marking vegan alcohol clearly now which is great. We have also found that this change has moved us towards a less wasteful lifestyle. 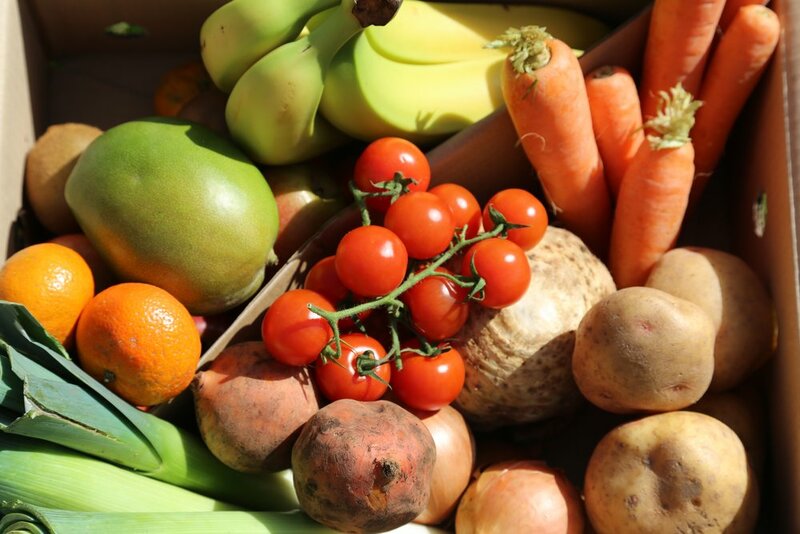 We try our best to buy local seasonal produce and reduce our environmental impact. We use reusable metal water bottles, keepcups for our coffee, reusable sandwich wraps, and sectioned lunch boxes to cut down on our waste. In terms of food, we compost all our fruit and veg leftovers in our garden and of course grow as much as we can. There are always ways to be better and we are by no means perfect or living anywhere near a zero waste life but we do our best and strive to improve.